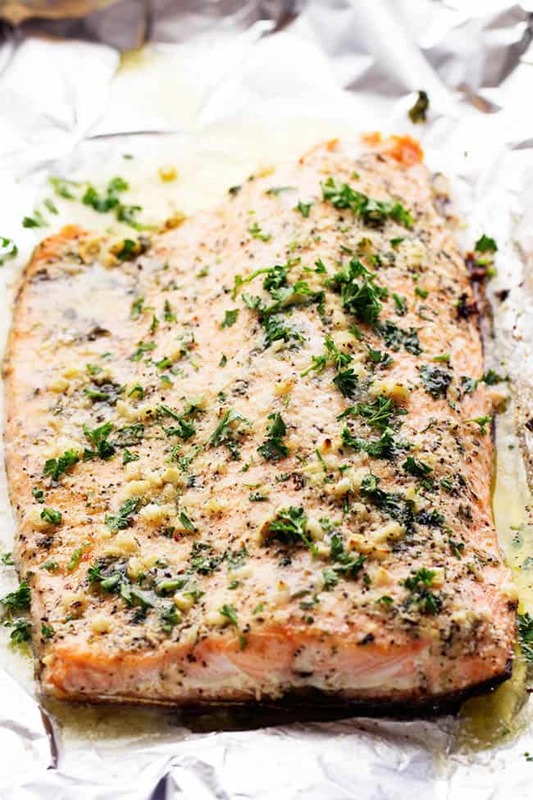 Salmon that is baked in foil and brushed in a Parmesan Garlic Herb Marinade. 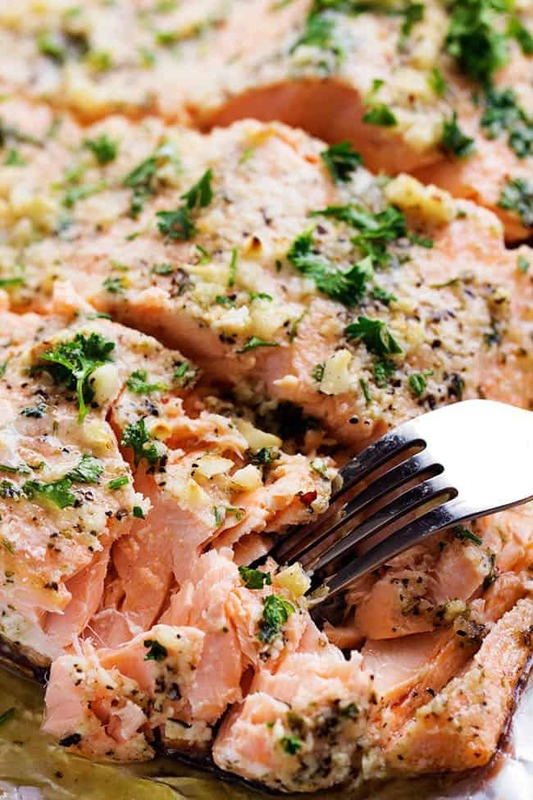 It seals in the amazing flavor and cooks the salmon to tender and flaky perfection! A couple of weeks ago I had the honor of flying to Washington DC with my hubby and speaking to the National Salmon Council. Now, you know how I love my salmon. Ok. Maybe I am a little obsessed since I eat it 4-5 times a week. But it was so amazing to speak to a group of people that are just as passionate about it as I am. The conference was amazing to be apart of and the hubby and I had so much fun site seeing in DC. I have always been to DC in the hot summer. We also took the kiddos and were walking to each of the sites in the heat. It was miserable. I remember catching a movie in the middle of the day just to catch a break. If you are following me on instagram you saw some of the fun things that we did. 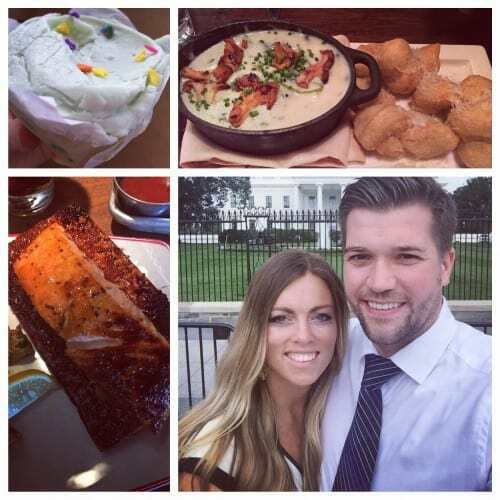 Isn’t traveling to new places so fun and trying out new places to eat?? Of course I had to get the Glazed Cedar Plank Salmon from Farmers Fishers and Bakers. With salmon always on the brain and incorporating it in my diet as apart of a healthy lifestyle, I am constantly thinking of new things to make. For some reason I haven’t posted a recipe yet with salmon in foil. Whaaaa??? So I knew that it was something that I had to try. If you have not tried salmon cooked in foil you need to stop what you are doing and make it for dinner tonight! It is so easy to put the salmon on the foil and seal all of the ingredients up into a packet. It seals in the the amazing flavor and makes clean up a breeze. 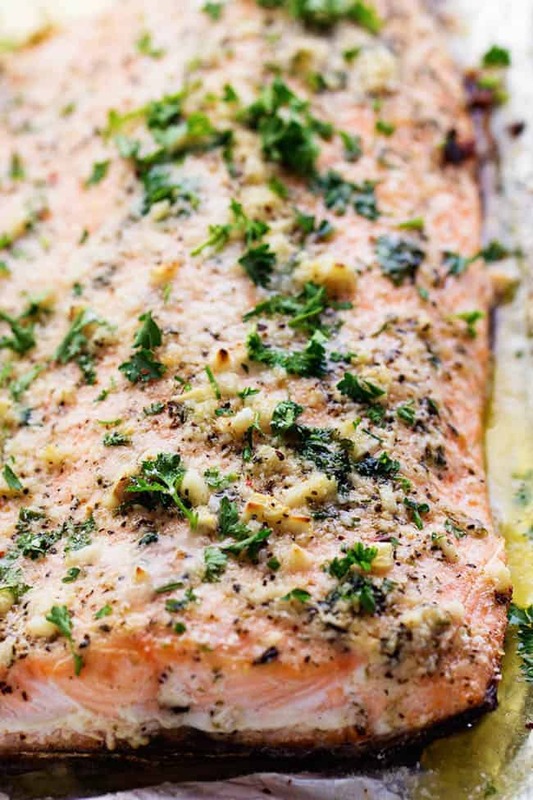 I LOVED the flavor that the parmesan garlic herb gave to this salmon. It turns out tender and flaky and full of all of my favorite flavors. I swear the butter made it more tender and it literally fell apart with a fork it was so amazing. As soon as it came out of the oven I broiled the top for a couple of minutes to crisp the edges a bit. It roasted the garlic on top and oh my gosh. This instantly became a new favorite. I loved baking salmon so much in foil I already am thinking of more recipes that I can make! As a busy mom this made it so easy to seal up the salmon, cook it for 15 minutes, serve it to my family, and throw it all away. Easy peezy and it makes an impressive meal. A five star meal that is sure to wow your family! Preheat the oven to 375 degrees. 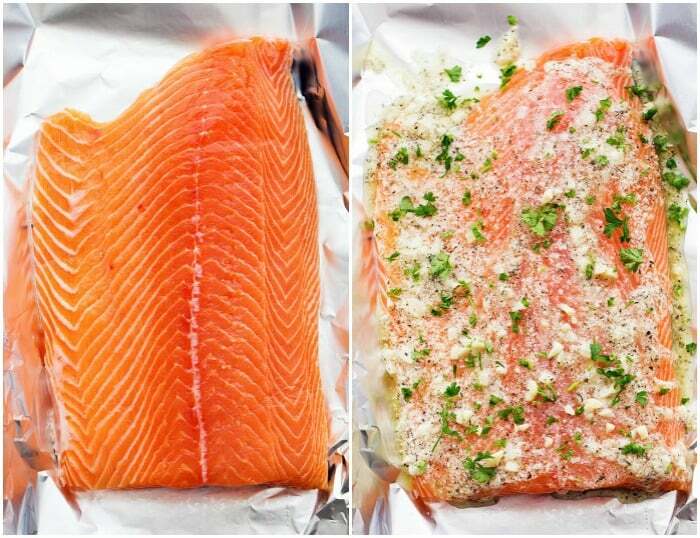 Lay out a piece of foil long enough to fold up the salmon inside. In a small saucepan over medium heat melt the butter. Remove from heat and add lemon juice, garlic, parmesan cheese, Italian seasoning, salt and pepper. Place the salmon skin side down on the foil. Brush with the garlic butter marinade. Sprinkle the fresh parsley on top. Fold up the edges of the foil and wrap and seal the salmon inside. Place in the oven and bake for 13-15 minutes or until the salmon is firm. Unwrap the top of the salmon and broil the top for 2-3 minutes watching closely so that it doesn't burn. Remove from the oven and garnish with additional chopped parsley and sprinkle with additional parmesan if desired. Ohhh wow. Normally I like salmon completely plain but now I’ve seen this combination of flavourings I want to try it! This salmon looks amazing! I definitely need to try this out. This recipe was AMAZING! Husband, 4 year old, and 1 year old approved! My boyfriend and I are obsessed with this recipe! We make it weekly now. It’s so simple and delish! “Wow” is all I have to say. But I will say more. I followed the recipe exactly. Very tender and juicy. However, the leftover salmon the next day was OMG. Crazy question I know: Would you change any of the baking instructions if you were going to use salmon that already had the skin off? Maybe less time or at a lower temp? I’m fairly new to cooking salmon so am over cautious on receipes! Made this for dinner last night. It was awesome! All of us LOVED it! Thanks so much for the great recipe. I am so glad to hear! I love salmon! I don’t like cooking in foil….do you think this could be baked in a glass dish ? Has anyone calculated the calories in this recipe? My fillets didn’t seem to cook evenly, I also halved the recipe for 2 servings. Should I have also changed the cook time? This dish is a real treat! I make this recipe at least once every two weeks! 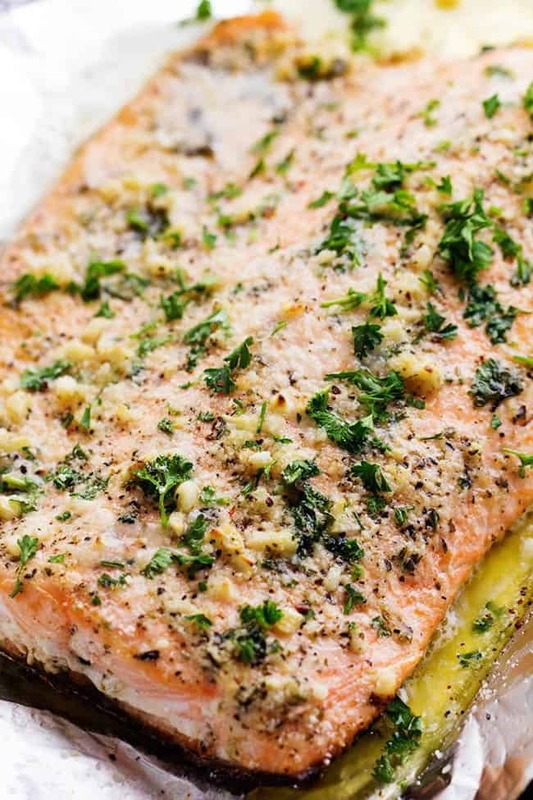 Did you use fresh Parmesan cheese or the kind in the canister for this baked Parmesan garlic herb salmon? Hi Alyssa: This looks great. If I would like to prepare this on the grill and finish up under the broiler, would the cook time remain the same? Loved this recipe! I used a side of salmon so I doubled the ingredients and cooked for almost twice as long. I used fresh shredded Parmesan and dried parsley. I will definitely be making this on a regular basis! 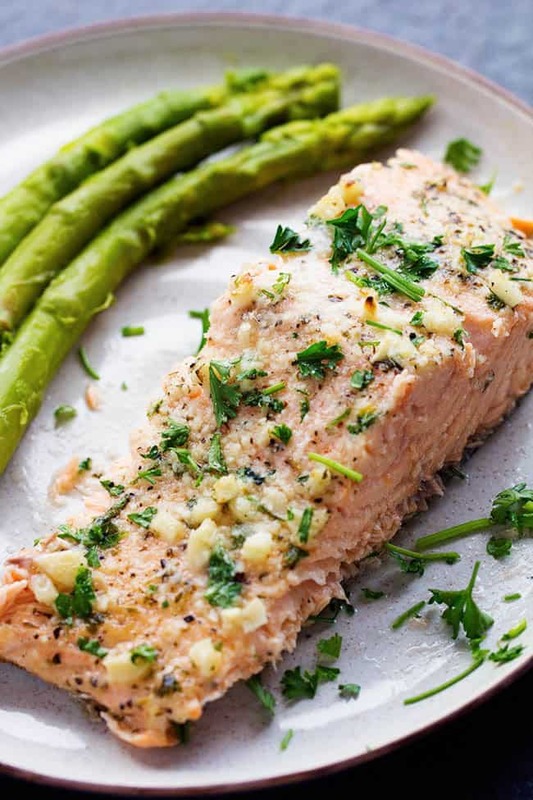 This is my favorite go-to recipe for salmon! Simple, easy and delicious…. great with a side of green beans and wild rice! Going to try it, but will use parchment paper as aluminum foil is not something that should be next to food as it leaches aluminum into the food…. Salmon is one of my favorite foods. I always eat it at least 3x a week. My hubby says I’m part bear. This was such a simple recipe and came out sooo tasty! I’m trying to stay away from cooking in foil, so next time I will try this in parchment paper. But I definitely will be putting this on my favorites list. Thank you!